The UBC eSports Association’s Overwatch team scrims against Rutgers University while team manager Natdanai Vootivakinskul (right) watches. The University of British Columbia is looking to establish scholarships for the growing number of its students who competitively play video games. The university’s awards development office is working on the scholarships with the UBC eSports Association, one of its largest student clubs, with more than 600 members. The club is excited to become officially recognized by the school for its success. Last year, their League of Legends team won $180,000 for the second consecutive year, but UBC only offered a single tweet in acknowledgement of their impressive feat. The eSports, or electronic sports, club started in 2010 with only a handful of students but quickly grew. Its teams of student players have won more than $500,000 since then in scholarships in international tournaments for games such as League of Legends, Counter Strike: Global Offensive, and Overwatch. In the past year, however, the North American competition has gotten significantly stronger. More than 40 colleges and universities have added eSports teams to their varsity programs, giving them an edge with established support structures and scholarships for attracting star players. 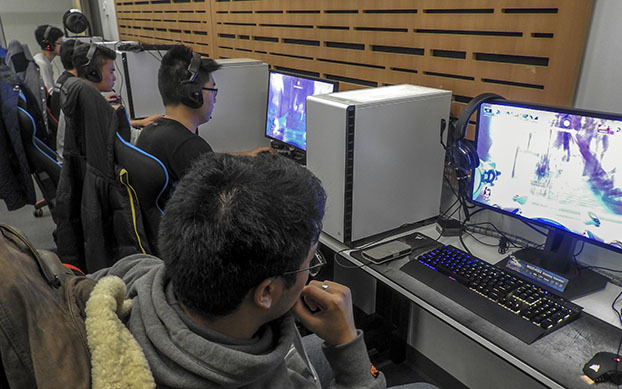 UBC’s eSports club has relied on support from UBC’s student union and sponsors, which helped establish a gaming lounge and practice facility, but lacked the benefits of official school recognition. Club executives considered applying to UBC’s athletic department as a recreational club last year, but have set their sights instead on eSports scholarships to entice prospective players. In the past, working together with the school seemed impossible. The difficulty, explained Bunyard, was that former UBC presidents weren’t open to the concept of eSports, a culture they knew little about. 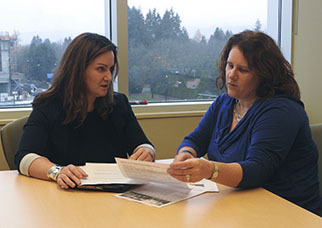 Lesley Campbell (left) and Janine Root (right) work out the details of the eSports scholarships. Now, Bunyard is working with the university’s award-development team to help members better understand eSports and develop a framework for eSports scholarships. “We’re trying to get our heads around how we can honour and recognize this successful club,” said Lesley Campbell, associate director of awards development at UBC. They’ve come up with two scholarships: an entrance award for prospective students with high game rankings and a service award for current eSports club members. “Enrolment can use the entrance award when they’re talking to high schools, and the service award would be for recognizing those helping the club and demonstrating leadership.” said Campbell. Once the awards are fully conceptualized, Campbell’s team will pitch the scholarships to potential donors, including club alumni and local gaming companies. They’re not worried about lack of interest, as organizations have been leaping at the chance to join the lucrative gaming market. Just this year, the eSports industry is estimated to generate US$696 million in revenue in the U.S. alone, a number that is expected to grow to US$1.5 billion by 2020, according to an industry report. Game companies have already established national leagues, multi-million-dollar tournaments, franchises sponsored by traditional sports teams like the New York Yankees, and a dedicated and growing fan base. UBC eSports competes in the two biggest university-level eSports competitions, TESPA and Collegiate Starleague. Those leagues and tournaments have seen more than 1,200 campuses represented and have awarded individual players thousands of dollars in scholarships. Though many competing teams are student clubs, an increasing number are official varsity programs. In 2014, Robert Morris University in Chicago became the first university to add eSports to its athletics department. Since then, National Collegiate Athletic Association Division 1 schools like the University of California-Irvine and Boise State University have joined the fray. Canada has two programs, one at St. Clair College and the other at Lambton College in Ontario, as well as a stand-alone eSports scholarship at the University of Toronto starting next year. ESPN’s list of varsity esports programs as of Oct. 25, 2017. Schools that have added eSports to their athletic departments are fully embracing the new program. At St. Clair’s College in Ontario, varsity eSports have been incorporated into the school’s marketing and recruitment. He’s seen that launching a varsity eSports program is not only more cost-effective than traditional sports, but that the reach can be even greater. 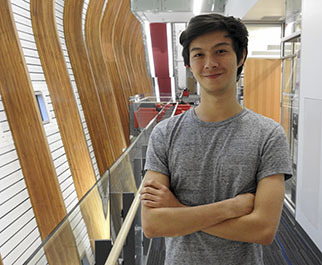 Tristan Bunyard stands at the UBC Nest, where the eSports club has its practice facility. But joining the athletic department isn’t entirely beneficial, said Bunyard. He’s seen that there are a lot of conflicting opinions within the eSports industry about whether a varsity approach is the best for collegiate eSports. “Certain universities don’t put a heavy emphasis on varsity and, in general, it’s been hard to work with athletic departments that don’t understand eSports,” said Bunyard. Although the UBC eSports Association could have joined the university’s athletics department as a recreational club last year, the offer was conditional on dropping all sponsors. It would’ve meant $5,000 in stipends, but doesn’t come close to the support sponsors have given the club, including helping pay for travel and setting up their state-of-the-art practice facility at the UBC Student Nest. Whether eSports clubs like UBC’s become recognized by their schools through inclusion in athletics or scholarships, many think the focus should remain on supporting players in their education. “Scholarships drive players to achieve success, but I don’t think they should be the sole driver for participation in eSports,” noted Peter Lin, president of the B.C. Institute of Technology eSports Association. Instead, Lin believes the end goal of collegiate eSports should be to create programs that benefit players outside of the games themselves. “There must be some values (in eSports) that have applications in other fields and industry,” said Lin. He pointed to game analytics, team building, conflict resolution, and event organizing as transferrable skills that should be further developed. UBC’s eSports club doesn’t have skill workshops yet, but it does place a high value on players’ education. Natdanai Vootivakinskul, manager for UBC’s Overwatch team, explained that all players on the club’s elite teams have to have at least a passing GPA. “If marks aren’t up to snuff, we’ll look into subbing,” said Vootivakinskul. When the new eSports scholarships at UBC get finalized, they’ll include a heavy emphasis on academic performance. One example being referenced is the new eSports scholarship at the University of Toronto. There, candidates require a 3.5 GPA and enrollment in the university’s faculty of applied science and engineering to qualify.